Our After-School Club is open on Monday through to Thursday from 1:30pm to 3:30pm. Children from Junior and Senior Infants may attend from 1:30pm to 2:30pm on two or more afternoons, while children from the more senior classes may attend from 2:30pm to 3:30pm for two or more afternoons. A light snack is provided with some juice and the children are supported in completing their homework assignments. 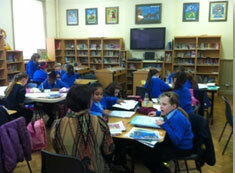 There are also a variety of games and activities for the children to take part in after homework is completed. If you wish to book a place for your child please contact Celine O Callaghan (Deputy Principal) who co-ordinates the activities. Regina, Norma and Maureen work in the After-School Club.